BEIJING, China, August 13, 2012 (ENS) – Three typhoons that blasted across Chinese coastal areas in the past two weeks have caused 51 deaths and left 21 people missing as of Monday, according to the Ministry of Civil Affairs. In Bangladesh, flash floods have killed 130, in India more than 100 people have died, while in the Philippines heavy rains and floods have claimed 92 lives. Typhoons Saola, Damrey and Haikui affected more than 30 million people in 12 provincial regions of China, the the Ministry of Civil Affairs said a statement today. Preliminary reports show that the storms have destroyed 88,000 houses and damaged 2.3 million hectares of farmland. Insurers have assessed that damage caused by typhoon Haikui alone has reached 1.46 billion yuan (230 million U.S. dollars), according to an announcement on Monday by China’s insurance regulator. The figure was calculated based on claims filed for property loss in typhoon-swept regions as of Monday, said the China Insurance Regulatory Commission, CIRC. Haikui has “inflicted heavy losses” on the southeastern coastal regions, with 45,681 insurance claims filed in cities and provinces including Shanghai, Zhejiang, Jiangsu and Anhui as of Monday, the CIRC said. The Ministry of Civil Affairs said Friday that more than 2.17 million people were evacuated from four provincial-level regions in east China. Haikui, which means “sea anemone” in Chinese, was the 11th typhoon of the year and made landfall in Zhejiang province last week, bringing gales and heavy downpours to China’s eastern coast. 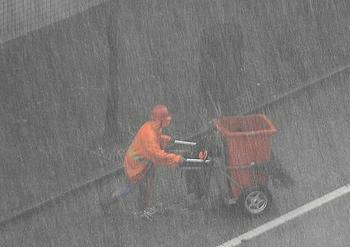 Meteorological authorities in Anhui said Saturday that Haikui had weakened into a tropical depression. Rains from the typhoon are moving westward, and caused flooding that stranded 12 trains running on the Wuhu-Guixi Railway, a railway line connecting Jiangxi province and neighboring Anhui province. More than 1,000 passengers were trapped for 10 hours in one train while repairs were carried out. Crew members provided food and water as they waited, before arranging alternative transport. In Bangladesh, flash floods and landslides have claimed more than 130 lives and directly affected up to a million families across the country. With more heavy rain forecast, and many families still unable to return home, the situation in some areas is expected to deteriorate over the coming weeks. In response, the International Federation of Red Cross and Red Crescent Societies has launched an emergency appeal for more than US$1.8 million to provide support for 47,500 people. The floods began in late June, the start of the monsoon season, and further downpours in mid-July caused flooding in new areas, compounding the disaster. Food supplies have been damaged, leaving families dependent on relief, and floodwaters have washed away existing crops, which will result in longer-term food shortages. People are still need basic necessities including food, housing support, and access to safe drinking water and toilet facilities. In India, residents of Assam state have been enduring the worst floods in many years, affecting more than two million people. Since June, the heavy monsoon rains have caused the River Brahmaputra and its tributaries to overflow, flooding thousands of hectares of crop land and destroying many houses. Over 100 people are reported dead and several hundred thousand have been displaced. The European Commission has responded to the Assam floods by providing €2 million. The aid is expected to reach around 80,000 victims, and will especially target the most vulnerable, such as low caste groups and tribal and religious minorities. More than 3.4 million people have been affected by the floods, said the National Disaster Risk Reduction and Management Council. On Sunday President Benigno Aquino led the distribution of family packs to residents of Montalban in Rizal province affected by the week-long deluge that brought torrential rains and floods to Metro Manila and nearby provinces. The President announced a flood mitigation program that includes a 100-kilometer (60 mile) ring-road dike along the rim of Laguna de Bay that is intended to put to a stop the perennial problem of flooding in Rizal and nearby provinces. The dike is part of a flood mitigation master plan from the Department of Public Works and Highways that aims to develop flood resilience. Northern Luzon emergency officials are now bracing for yet another storm. Tropical Storm Helen is due to hit the island within the next 24 hours with maximum sustained winds of 65 kilometers per hour (40 mph) near the center, gusting to 80 kph. The UN’s World Food Programme is working with the Philippine government to make sure that families affected by the floods have something to eat. “WFP is saddened by the humanitarian impact of the non-stop rains over the last week in the Philippines, and we would like to reiterate our solidarity with the Philippine Government during times of emergencies,” the WFP representative to the Philippines, Stephen Anderson, said in a statement today. Since the onset of the flooding, Philippine Red Cross has mobilized more than 1,800 staff and volunteers, to support search and rescue efforts and to distribute relief supplies. The IFRC has launched an emergency appeal for US$944,220 to help the Philippine Red Cross continue to provide relief to devastated families. First aid, psychosocial support and emergency assistance have been provided to flood-affected communities. More than 97,000 people have been served with emergency food packages while another 73,000 have been provided with hot meals in relief centers. More than 55,500 litres of fresh drinking water has been delivered to help prevent the spread of disease. The European Union is allocating €700,000 to support the emergency response and provide relief to the families affected by floods in the Philippines during the past week. The funds will be used for distribution of relief items, water and sanitation, debris clean-up, food assistance, shelter support and medical aid. Over 127,000 vulnerable people in need of urgent assistance are expected to directly benefit from this funding. 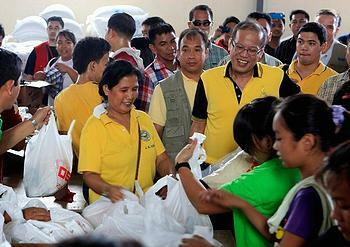 President Aquino told some 700 volunteers preparing food products for flood victims at the Department of Social Welfare and Development’s National Resource Operations Center in Pasay City that it is time to acknowledge volunteers who, through their efforts, have made their less fortunate fellow citizens feel loved and not alone.